Over the last couple of decades we have seen a steady increase in thicknesses of insulation being used in construction. This has, however, had an impact on design in both the new build and refurbishment sector. In terms of the thermal design of a flat roof, what are the options and the best practices of flat roof build ups? In the case of a flat roof, insulation is usually either a rigid board above the deck, or a mineral glass/wool quilt immediately above the underdrawn ceiling, depending on the type of roof design and construction. A cold roof construction will normally comprise of a structural deck on joists or purlins with a ceiling layer fixed to the bottom of the joists/purlins thereby creating an air layer or cavity within. Insulation would normally be placed in the lower portion of this void mostly sitting on or just above the ceiling structure. Depending on the type and thickness of insulation used warm moist air will be controlled accordingly preventing any or too much warm air meeting the cold air layer thus negating a condensation risk or actuality. A vapour control layer would ordinarily be placed at (above) ceiling level. 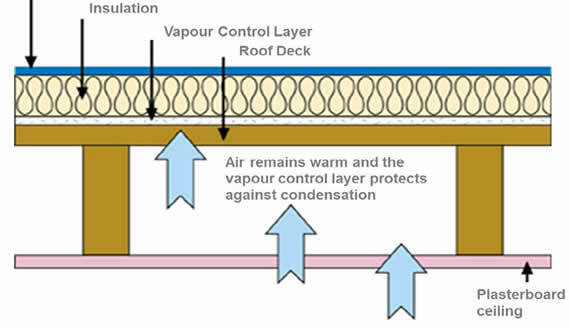 Adequate ventilation must be provided between the insulation and the underside of the roof deck to prevent the risk of interstitial condensation forming within the void area. 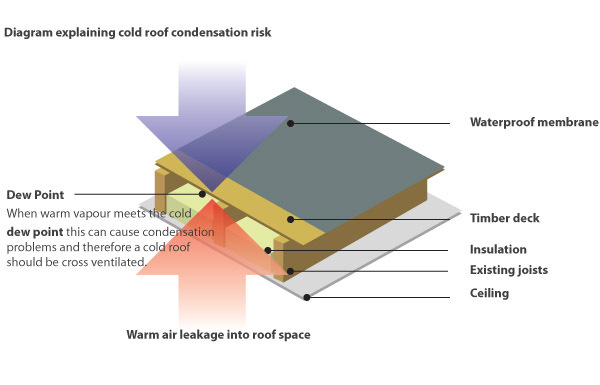 A cold roof design is generally not recommended for new build roof applications due to the added requirement for roof void ventilation and the difficulties in preventing cold bridging through the system. Cold bridging occurs when there is a continuous path created through the insulation. If an existing cold roof is to be refurbished, consideration should be given to converting the design to a warm roof, or incorporating new insulation into the roofing system to improve thermal performance. However, if the latter is the case, thermal calculations will be required in order to analyse the likelihood of condensation risk. 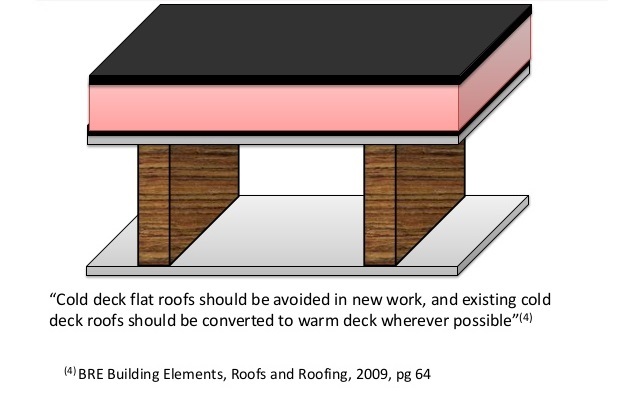 In a warm roof construction the principal insulation layer is placed above the structural decking, resulting in the structural deck and support structure being at a temperature similar to that of the building interior. A vapour control layer beneath the insulation is required to prevent moisture vapour being driven into the insulation through thermal pressure from within the building. The waterproofing system is placed over the insulation to completely encapsulate it. Unlike a cold roof design there is no requirement for roof void ventilation. Cold bridging through the system is easier to eliminate or control as ordinarily there are no breaches from the structural supports as there is in a cold roof construction. Warm roof build ups can be installed on most modern construction material types such as concrete, timber and timber based sheets. They can be built up from profiled metal decks as the insulation selected would provide enough rigidity to span the open sections of such decks. However, advice should be sought if using profiled steel decks with a wider open area or “trough”. It is not unusual for designs to keep roof levels to a minimum and there is a trend when designing a warm roof to include some of the insulation below the structural deck as well as above. There is a likelihood that this practice could contribute to a condensation risk and therefore it would be strongly recommended to have a condensation risk analysis carried out to highlight any potential issues. 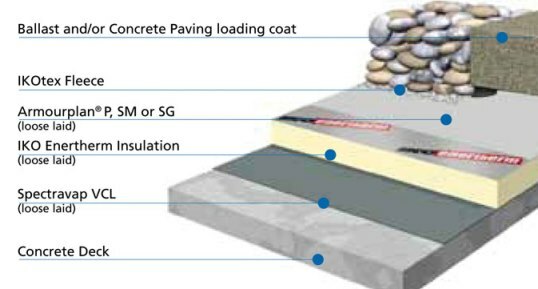 An inverted roof construction sees the principal thermal insulation layer located above the roof structure and also above the waterproofing, This method results in the waterproofing, the structural deck and the support structure all being at a temperature similar to that of the interior of the building. No vapour control layer is required. A further benefit of this type of flat roof build up is that the waterproofing layer is “hidden” and thereby protected from the effects of solar gain. Given that the specially selected insulation layer is loose laid it will require ballasting to guard against wind uplift or “Floating” in wet conditions. The ballast would typically be round washed gravel (20mm – 40mm) or paving slabs. Paving gives the opportunity to use the roof as an access area for recreation or more commonly for housing service units. Due to the imposed loading of the ballast layer, as well as any roof mounted plant, this type of flat roof build up is generally only used for flat roof applications to concrete roof structures. In a flat roof, the waterproofing is always supported by a structural roof deck. This mostly takes the form of timber based boarding of some type, which in turn is supported on joists. The ceiling will usually be fixed directly to the underside of the joists. The construction of the roof deck and ceiling has an important effect on the behaviour of the waterproofing material on top, as does the selected placement of the insulation layer. At low temperatures, cold roofs are inherently prone to condensation, which can cause materials to decay and distort. To reduce this risk, through-ventilation has to be provided to each and every space above the insulation but this is often difficult to achieve; for example if the roof abuts the wall of a house. Cold roofs should not be endorsed for the climatic conditions in Scotland, according to the Building Standards (Scotland) Regulations. Although the Regulations do not prevent the use of cold roof constructions, warm roof constructions are recommended.